Among corporate plans, the financial sector achieves highest ratio, while energy and telecom lag. If you were a corporate pension plan tied to the S&P 500 in January, you had a pretty good time. Global equity markets were up about 8% last month, helping raise the average funded status from 83.8% to 85.9%, according to Northern Trust. The Federal Reserve, which troubled markets last year with interest rate hikes, lately has signaled it will be “patient” at its January meeting, which set the stage for January’s rally. Funding ratios had fallen in Q4 2018 due to the Fed’s rate hikes and September’s selloff, but recovered some in January. Lower discount rates also helped, as the average rate dropped from 3.91% to 3.75% at the start of the New Year. Funding ratios were still down from the year prior, when they reached 88.7% in the previous January. They peaked in September at 90.7%. 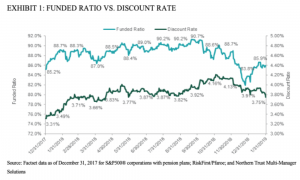 Although funding status differs from plan to plan due to factors such as asset mix, plan status, and funding history, the financial industry had the highest ratio at 97%, according to Factset data. Telecom and energy tied for lowest, at 79%. 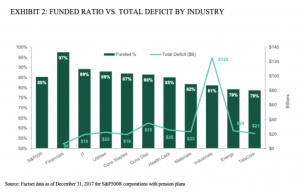 As of December 2017, the S&P 500 corporate funding deficit dipped by $32 billion, to $287 billion.